Banjo-Kazooie: Grunty's Revenge is the third installment in the Banjo-Kazooie series and was released in 2003 for the Nintendo Game Boy Advance. The game was developed by Rareware, as were the two previous games in the series, and was published by THQ. The game uses an overhead, top down platform design to replicate the 3-D feel of the previous console games in the series but on a smaller scale. It was the first game in the Banjo-Kazooie series to not be released in Japan. Although Banjo and Kazooie do not recognize many of the main characters in Banjo-Tooie after meeting them in this game. Banjo-Kazooie Grunty's Revenge features many of the Abilities that were previously in Banjo-Kazooie and Banjo-Tooie, as well as introducing newer moves. This game is both an interquel and a sequel to the Nintendo 64 games, in that the opening and ending take place between them, while the majority of the action takes place 20 years before the first. Two months have passed since Gruntilda fell from her tower, putting the events of the game before that of Banjo-Tooie in the timeline, and she is still trapped beneath the boulder. After trying to push the boulder off of herself, her loyal henchman Klungo decides that a different plan of action is required, so he builds a Gruntilda-shaped robot, the Mecha-Grunty, into which Gruntilda's spirit transfers. While her real body would still be stuck underground, she could now initiate a scheme of revenge against Banjo and Kazooie at will. Kidnapping Kazooie, she goes back in time with the plan to prevent the bear and bird duo from ever meeting in order to erase her prior defeat from history and restoring her to her previous self. Springing into action, Mumbo Jumbo uses his own powers to send Banjo back to the same time to put a stop to Gruntilda's evil time-space continuum altering motives. Now, with the help of Bottles' ancestor, Bozzeye, and a young Mumbo Jumbo, Banjo must thwart Gruntilda and rescue his pal Kazooie. He does so, and causes Grunty's spirit to return to her body under the rock, setting the events of Banjo-Tooie into motion. Spiral Mountain: Is the main hub world for the game. Cliff Farm: A farm based level filled with Gruntweeds and Gruntlings. Banjo battles Klungo in this world.it is also home to a flock of sheep and two hens who need Banjo's help. Breegull Beach: Banjo battles Gruntilda and rescues Kazooie in this world. Banjo will have to battle hopping clams and evil exploding mines. Bad Magic Bayou: An early version of Mad Monster Mansion. Banjo and Kazooie battles the tee-hee ghosts from Banjo-Kazooie in this world. Also the water is very toxic and will hurt the player if he jumps in. Spiller's Harbor: A harbor in which Banjo and Kazooie battle seagulls and toxic blobs which will hurt Banjo and Kazooie. The player can buy ice cream from a Peacock ice cream salesman so that He/She can bring it to gooey creatures that want to go back to there mummy. Freezing Furnace: An early version of Grunty's Industries in which Banjo and Kazooie must travel from an icy side into Grunty Industries. Grunty's Castle: Area where the final battle takes place between Banjo and Kazooie and Klungo and Gruntilda. Banjo and Kazooie will also have to answer questions about the game as they did in Banjo-Kazooie and Banjo-Tooie. The game's music was composed by Jamie Hughes instead of Grant Kirkhope, composer of the console titles. Sound effects are sticking true to the classic sounds of Banjo-Kazooie and Tooie. However since the Game Boy Advence games aren’t able to store as many sounds in their memory as the N64 games, characters’ voices are comprised of less sounds, and thus some voices sound repetitive. Banjo-Kazooie: Grunty's Revenge was the first Rare game released after being purchased by Microsoft from Nintendo, even though the game was released for a Nintendo game system. This is the first game in the Banjo-Kazooie series where Kazooie can't fly. 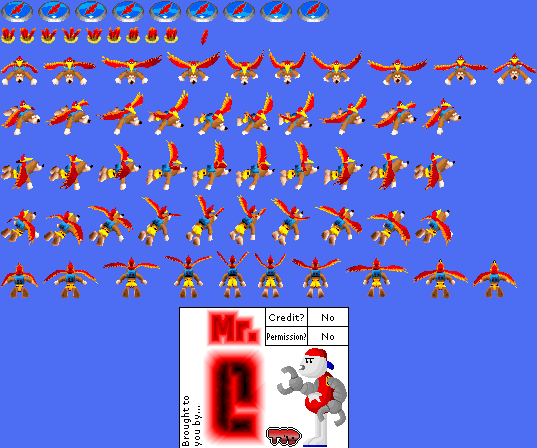 However, sprites for flying, Red Feathers, and Flight Pads can be found unused in the game's data. While Gruntilda's plan is to prevent Banjo and Kazooie from meeting, the only thing she does in the past to actually be proactive in causing that is to imprison the Breegulls. After they are freed, all she and Klungo do is attempt to defeat the time-travelling Banjo and Kazooie from the present, with the initial plan never being brought up again. Many continuity-based plot holes are caused by this game being released significantly later than the other two and taking place both between them and before either of them. Most of these are related to character design and knowledge of one another, in that due to this game, Banjo and Kazooie should know of Klungo, Jiggywiggy, and Honey B. by the time of Banjo-Tooie, but act as though they had never met. Furthermore, Mumbo Jumbo looks like he does in Banjo-Tooie in the past, despite how in Banjo-Kazooie, only his face was a skull instead of his entire head. This page was last edited on 21 March 2019, at 00:54.